Our Dairy department offers a wide variety of the products customers love and expect to find. From our huge Yogurt selection to Farm Fresh Eggs to a large variety of Bongard’s cheeses, we have the items our valued customers want and need. We recently expanded our Coffee Creamer selection and now have over 30 varieties. 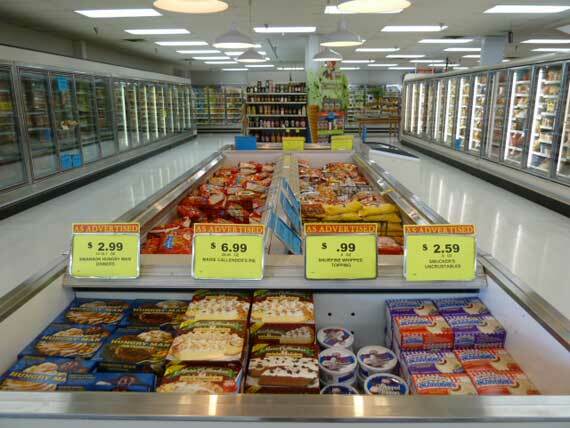 Our freezer department offers a large selection of all of frozen grocery needs. We have the area’s largest frozen Pizza selection which includes brands like Heggie’s, Brew Pub and Culinary Circle. Our Ice Cream selection is top rated with our feature brand Stone Ridge Creamery. Our Stone Ridge brand offers ice cream novelties as well as family size servings. We also offer a variety of Gluten Free products which include breads, buns, dinner rolls, muffins, waffles, pie crusts and many others.